1800: King George III is on the British throne. Unregistered magic users are pursued to the death. And genteel households are served by uncomplaining rowankind bondservants. Privateer captain and unregistered witch Rossalinde Tremayne has just inherited a magical box. With it comes a half-brother she didn't know she had, and a task she doesn't want: open the box to right an ancient wrong - and free the rowankind. Guitarist Eddi McCandry has just dumped her boyfriend and their band when she finds herself running through the Minneapolis night, pursued by a sinister man and a terrifying dog. As she soon discovers, the two creatures are one and the same: a phouka, a faerie being who has chosen Eddi to be the mortal pawn in the age-old war between the Seelie and Unseelie Courts. Eddi isn't interested, but she doesn't have a choice: to save the city that she loves, Eddi must face off against the Dark Queen of the Unseelie Court in the ultimate duel of music and magic. The first intelligent species to encounter humanity attacked without warning. With little hope of halting the invasion, Earth dispatched three colony ships to different parts of the galaxy. 150 years later, the planet Darien hosts a thriving human settlement. But hidden on Darien's forest moon are secrets that go back to an apocalyptic battle between ancient races. Darien is about to become the focus of an intergalactic power struggle, and the true stakes are beyond human comprehension. Elizabeth Barnabus lives a double life - as herself and as her brother, the private detective. She is trying to solve the mystery of a disappearing aristocrat and a hoard of arcane machines. In her way stand the rogues, freaks, and self-proclaimed alchemists of a traveling circus. But when she comes up against an agent of the all-powerful Patent Office, her life and the course of history will begin to change . . . and not necessarily for the better. According to 'The Nice and Accurate Prophecies of Agnes Nutter', the world will end on a Saturday. Next Saturday, in fact. The armies of Good and Evil are amassing, the Four Bikers of the Apocalypse are hitting the road, Atlantis is rising, frogs are falling - everything appears to be going according to Divine Plan. 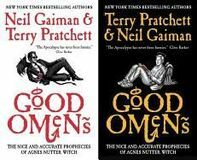 Which is a major problem for Crowley, Hell's representative in England, and Aziraphale, his angelic counterpart, because they like it on Earth. So, to stop Armageddon from happening, they've got to find and kill the Antichrist. (Which is a shame, as he's a really nice kid.) There's just one glitch: someone seems to have misplaced him. Henry was the sharpest data-thief in the Matrix, until an ex-employer crippled his nervous system. Now a new employer has recruited him for a last-chance run against an unthinkably powerful AI. A lone human emissary is sent to Winter, an alien world where inhabitants can choose and change their gender. His goal is to facilitate Winter's inclusion in intergalactic civilization, but to do that, he must bridge the gulf between his own views and theirs. The Terrans, the Phrenorians, and the (ta)Klar are fighting for control of the jungle planet Makaum and its resources. While battling Terran drug cartels, military corruption, and a brewing civil war, can Terran Military Master Sergeant Frank Sage stop Phrenorian officers from staking a claim on the planet? After an alien planet somehow becomes 'entangled' with one of the Long Earth worlds, Lobsang and Joshua discover that its voracious denizens intend to capture, conquer, and colonize the Long Earth.